For many years the idea of balance has been growing in my mind, and in the past year I have been seeing the reality of cycles and rhythm. Last night, the two came together. My wife and I have been having several discussions about cycles, phases, ebbs and flows in life. At times we have energy, at times we don't. One day we are focused, the next we aren't. For a while we operate logically, and then we ease into intuition. Life has cycles. Nature has rhythms. Often times we want to be even keeled and not have these shifts, so we see them as negative. As we move into a new phase in the cycle, we think something is wrong. We fight against the natural flow and add fear and anxiety to the mix, leaving us with little or no peace or joy. Instead of realizing that there is a time and a purpose for everything and finding the good in the situation, we despair and we fight the natural cycle. The end result is that we miss the good, and we create more bad. A well-respected local psychologist once told me that there are many causes of depression. And ironically, one of the more common ones is the body and mind's natural attempt to slow us down when we need it but we won't choose it willingly. We get tired, we get overwhelmed, our body and mind put out signals that we need to rest, but we ignore them. The situation gets worse. Eventually, our body and mind take control of the situation and say "We're going to take a break here." The slowing down is a natural process. The negative feelings are our response to fighting the natural process and despairing because we can't seem to force ourselves to be superhuman. Times come when we need to slow down and rest. And these times come regularly. Every night we need to go to bed and get rest for the next day. Every week we need some down-time while we're awake to relax and recuperate. On a bigger scale, we find weeks when we have more energy and weeks when we seem to have no motivation at all. Embracing the down time part of the cycle has a purpose. When we're laying on the couch not wanting to get up and get the house cleaned up, we have the opportunity for our minds to be freed up and to sort through perhaps some very important issues that we wouldn't otherwise have an opportunity to think through -- and often times that happens naturally simply in the process of relaxing. So last night. I was thinking about intuition and logic. I'm a software architect by profession and most of my days are spent primarily in logic, though when I'm doing an initial design and even when I'm writing some of my best code, I operate at a more intuitive level. Looking through my history, my intuition has come out in my spiritual life in many aspects. I have had many moments of intuition where I have been able to offer insight and encouragement to people that my logical mind, at least at the conscious level, could not have pieced together. I also remember times when my intuition got out of balance with logic and it became something unhealthy. What brought my mind to the thoughts of logic and intuition was that I've been flowing in intuition more lately and I got an "out there" feeling that led me to want to immerse myself in intuition but then I remembered where that had taken me in the past. And so I pondered, "How do I keep the flow of intuition going without going off the deep end?" When logic ebbs and intuition flows, how do I not let intuition become unhealthy? And the answer is to keep a presence of logic there when flowing in intuition. And when my intuition ebbs and my logic flows, how do I keep my logic from becoming cold and short-sighted? By keeping a presence of intuition in the midst of my logic. Logic balances intuition and intuition balances logic. There seems to be a natural ebb and flow between the two, but the presence of one within the other keeps that cycle healthy and balanced. As I thought through this, the symbol of yin and yang came to mind. The visual skillfully reflects the ideas of cycles and balance within those cycles. From one side to the other is a complete cycle of yin waxing and yang waning, and yang waxing and yin waning. And in the midst of those cycles, the circle of yin inside the the yang balances it, as does the circle of yang inside the yin. This understanding has been so profound to me and has so many applications. 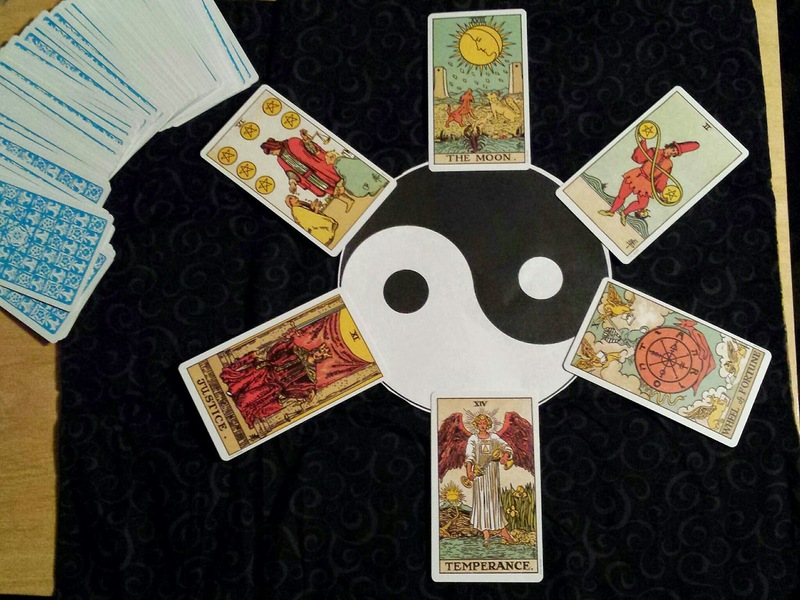 I have included the Six of Pentacles in the introductory picture of this post because it has so much meaning to me personally in this matter. The Six of Pentacles often speaks of those who have much giving to those who have little, and a balance coming into play here. Another balance is that in giving to others, you have to be sure to be giving to yourself (or receiving from outside of yourself). Giving and receiving ebbs and flows, but each must be present within the other in order for it to be healthy. Giving without ever receiving will leave you depleted, while receiving without ever giving will leave you empty. When you love others, you must not lose sight of loving yourself. When you love yourself, you must not lose sight of loving others. Learning to see and embrace the natural cycles can be very positive and healthy, especially when combined with keeping the cycles balanced along the way. This is such a deep topic with so many other thoughts. I may post in the future with some implications and practical applications.